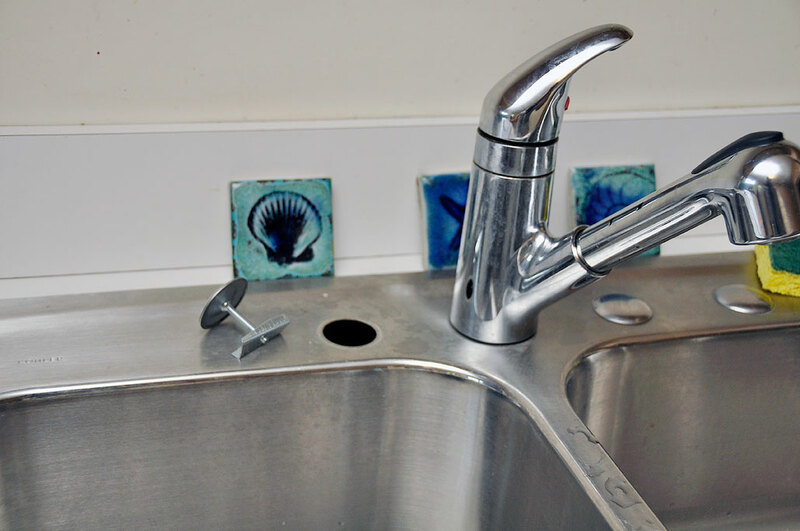 Originally, we had the Aqua-Pure faucet installation scheduled for later in the month. Our plans got shuffled a bit and a slot opened up unexpectedly. Never wanting to let an opportunity to get their hands dirty pass by, the interns convinced us to move the Aqua-Pure project up the queue and get it done. We decided to install the Aqua-Pure AP Easy because it was both the more advanced of the two systems and its appeared simpler to set up. 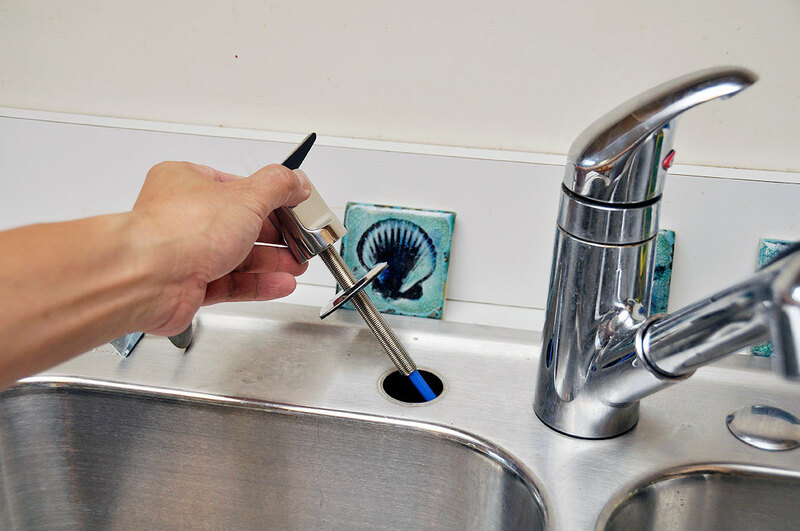 There were three basic steps to the installation: mount the filter head, attach the cold water feed, affix the faucet. 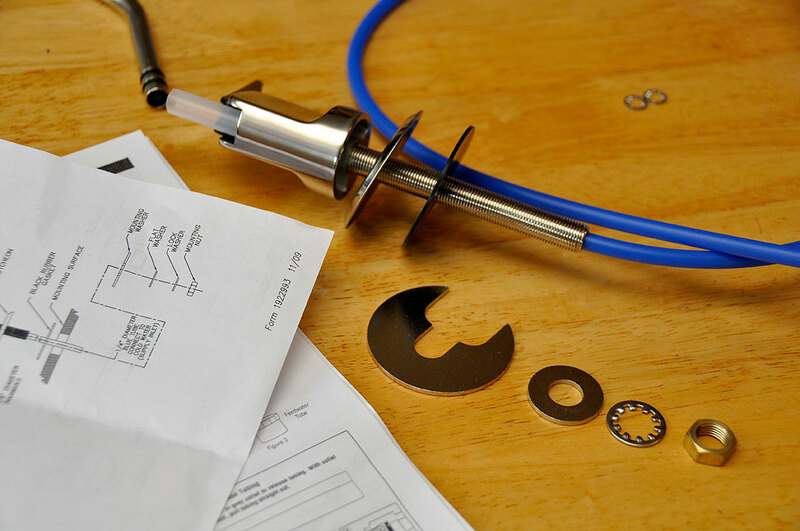 The kit was designed to minimize the tools required for installation. In fact, all we needed was a screwdriver and an adjustible wrench. A power screwdriver was helpful in mounting the filter head. The adjustible wrench was needed to detach the flexible hose from cold water feed and to tighten down the AP Easy faucet. All of the tube fittings were of the “push-in” type and required no tools. No other steps required the use of tools to complete. We mounted our filter on the right side of the cabinet. It was closer to the cold water feed and would be easy to access when we need to change the filter. Adding the adapterto the cold water feed and inserting the various tubes were very simple. Hand tightening was all that was required. The supplied tubings had no problems reaching the inlet portof the filter head even from the back of the cabinet. A sharp turn in the tubing would have impeded the flow of water, so we took care to loop the tubings in such a way that nothing kinked. The AP Easy kit came with a filter monitor strip. We activated and affixed it once we had the filter mounted and the tubings hooked up. The filter cartridge will last for about six months (750 gallons). The monitor is not meant to be indicative of the quality of the filtered water or the efficacy of the current filter, but to remind us how long the cartridge has been in use. Of course, we could have just written the installation date on the side of the cartridge with a Sharpie. With the adapter in place and the cartridge mounted, it was time to install the faucet. This particular step took a little more body contortion underneath the sink. The stainless steel sink came with three pre-cut openings. In order to remove the cover, we had to free it from underneath. We chosed the one on the left side because it was the easiest one for us to free. Once we had the cover off, we were able to insert the faucet base. We found it easier to lock down the base if we had one person holding it in place on top while another tightened the nut underneath the sink. With the faucet base in position, all that was left was to insert the stem, turn the water back on, and check for leaks. There were none. 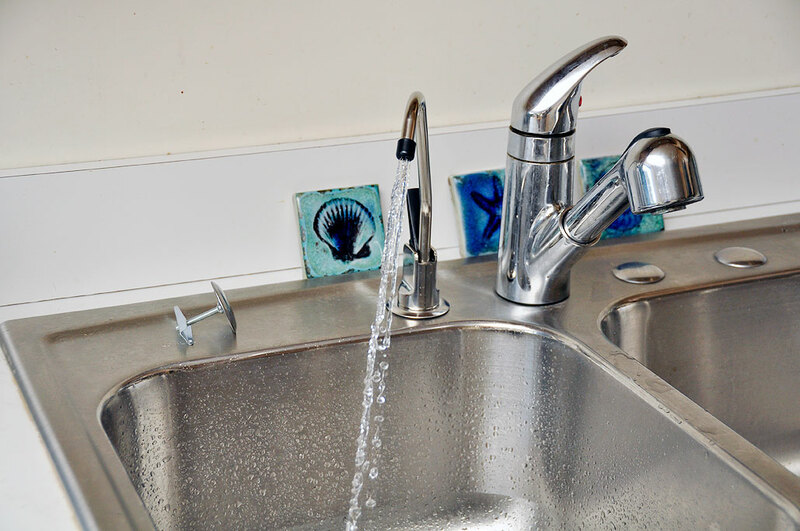 When we lifted the handle to the new faucet, the water sputtered a bit then flowed freely. We were surprised at how much faster the flow was compared to the typical drip filters. The installation took us about 35 minutes. The only difficult part was getting under the cabinet to remove the cover and to tighten down the faucet. This was a very straightforward DIY project. Much of the credit for the ease goes to Aqua-Pure’s use of the simple “push-in” connectors for all of the fittings. We’ll have an InTheWild update on how we like the AquaPure in a few months. In the mean time, feel free to drop us a line if you have any questions. When we first got the ZeroWater pitcher, we were going to do a head-to-head comparison to see if we could tell the difference between bottled water and the ZeroWater filtered water. Now that we all of these other filters (Hydros, Restore, AquaPure) in house, we will have to set up a more comprehensive comparison. Hopefully, we will have time soon to set up the double-blind comparisons as the results will surely be most interesting!